In late December 1958 ten of us Grantham passed cleaners were sent ‘on loan’ to King’s Cross, along with 15 from New England. 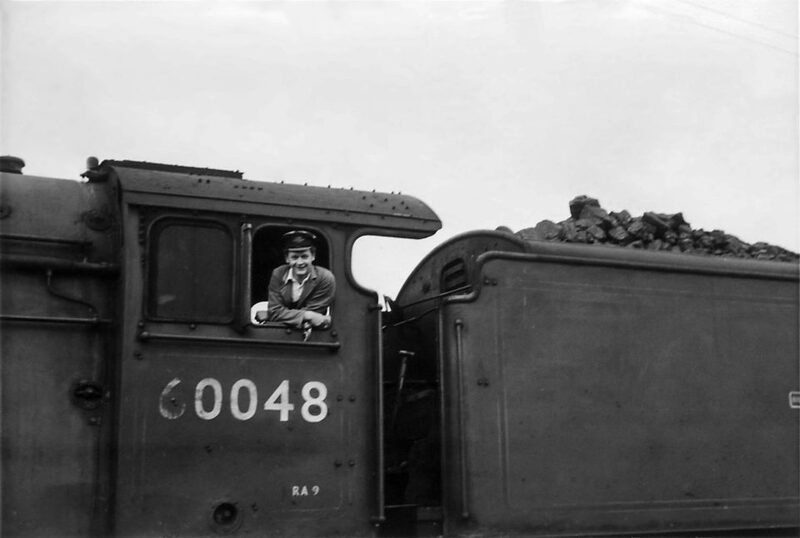 Drivers at King’s Cross were being trained on diesel locomotives and the passed firemen there [men who had qualified as drivers but were still working as firemen while they awaited driver vacancies] were covering the driving duties. We passed cleaners were called up to cover the resulting shortage of firemen. We worked more on the suburban than main line workings initially, slung straight onto L1s and N2s on the suburban and empty stock in and out of King’s Cross, and even ‘down the hole’ to Moorgate. I frequently fired on L1s [the L1 was a tank locomotive of post-war design used on suburban services out of King’s Cross]. I remember my first trip on one, an early morning train from Welwyn Garden City to King’s Cross. I'd not a lot of idea of the road of course, being a young passed cleaner from Grantham. It was dark, you went like a bat out of hell between stations and boy did they ride rough at speed. I hit the firehole door a time or two, coal all over the place. You have to get a grip damn quick! You soon learn how to ease things a bit, such as chucking as much coal in the firebox as you can while starting off at, or approaching, stations ’cos at speed it was difficult to hit the firehole! They were used also, of course, on empty coaches out of King’s Cross to Bounds Green carriage sidings, which were on the up side near Wood Green station. So we had to go over the flyover there to get on the up side Hertford line, and then propel the coaches into Bounds Green and slowly through the washer. The L1s were a bit light on their feet, and if the ‘board’ was not off drivers used to stop well short of the gantry of signals to get a run at the flyover. Here is a link to a two-minute slide show of photographs of L1 locomotives in the London area. These are on the Great Eastern section, not the Great Northern where Roy was based, but they show the kind of work these engines and their crews did. I had a few trips firing 9Fs, mainly from King’s Cross Goods or Ferme Park Yard to New England. A nice engine to work on of course. A little story: on a ballast train at Harringay one Sunday with a 9F, my leather lunch bag (they were all the go at that time, from the army and navy shops) was in the cupboard on the tender front. When I opened the cupboard my bag had shrivelled up like shrink wrap around my lunch tin. It turned out the tender water sprinkler pipe went through the back of the cupboard and it had sprung a leak, filling the cupboard with steam! I think I got my snap tin out, but can't remember if my ‘sambos' were eatable. Ah well, it was just another day. When at King's Cross I got on the odd main line job. I think the reason was because the suburban links were based at King’s Cross station by then, so firemen were not so easily available if someone didn’t turn up or, if they did, they were a bit ‘under the weather’! I had my first main line trip on an A1, No. 60131 Osprey, from King’s Cross to Doncaster non-stop one Saturday in 1959 with driver Harry Bartlett. I’d swapped with a mate I lodged with, raring to get a go on the ‘big ones’. Old Harry wasn’t too keen, with me being ‘just a boy’, but as the trip got underway he was pointing out places of interest to me. As we were non stop to Doncaster we needed to pick up water. I had done my homework, being young and keen of course. I knew pretty much where the troughs were and I managed ok at all the troughs we passed. Harry even gave me a fag, and on the way back ‘on the cushions’, said I’d done well - praise indeed! A trip I will never forget, of course. Here is a link to a photograph of No.60131 Osprey northbound at Essendine, a few months before Roy's first trip on the main line on this engine from King's Cross to Doncaster. That first 150 mile trip to Doncaster was eclipsed by my second a month or so later. I went with Driver Pumfrey of Top Shed one early morning from King’s Cross to Grantham with a Grantham A3. On arrival we went off with the engine to the Loco. There was just enough time to mash in the little hut near ‘London Road’ (the two loops near the exit from the Loco, where prepared engines were placed; there was a phone there to the North Box to tell the ‘bobby’ when you were ready to leave the shed), and then we got on the prepared engine for the return working, the 8.35am to King’s Cross. This was none other than A4 No.60007 Sir Nigel Gresley. Word somehow got around that I was there and a fellow spare fireman, Steve Taylor, came and built the ‘back corners’ up for me. Another trip which, of course, I will never forget. Class A4 No.60007 Sir Nigel Gresley prepares to leave Grantham for King's Cross on 24th May 1962. Photograph by Cedric A. Clayson. I almost always topped up with water when going over troughs, if on an engine so fitted of course. It saved you clambering up the tender and wielding a wet, heavy leather bag about. Call it lazy if you like. I remember sometimes ‘overdoing’ it a bit with the scoop and flooding coal out onto the footplate, the water being forced up the two tank vents in the coal space, round the ‘U’ bend and downwards onto the coal. These vents were at the front end of the tender. I don't recall ever losing the tip of the scoop, but it was something to be aware of. I used to wind the scoop down three or four turns I think, watch if you're making a ‘splash’, and if water is coming out stronger and out higher holes in the ‘stick’; also watch for the end of the troughs approaching, and put all your strength into winding the scoop up. I always thought the speed limit was 60 over troughs, but would stand corrected. I do feel the faster you were going, the more force generated on the scoop, making it harder to wind out. I once took an engine out of King’s Cross station on my own - without a driver. Driver Larry Goddard and I relieved an incoming A4 crew in ‘the Cross’. Larry cleared off to the snack bar. Told me to take the engine to the end of the platform if the empty coaches were taken away from behind us. They went, I did that, and soon the dolly [shunting signal] came off to reverse up to Belle Isle, across to the spur, and then forward to Top Shed and onto the turntable. Going up to the spur, then levelling out and going downhill slightly towards the buffers, especially with a big engine like an A4, meant good control of the regulator and brake, but I did myself proud, including turning the engine …but where the hell was Larry? I can't remember; it was just another day!! On another occasion with Larry, on night shift in Holloway carriage sidings (I was often on that job, usually with driver Brazzaggi - not sure of spelling), Larry cleared off for a couple of hours again! I reckon he had a bit on the side in that snack bar just outside King’s Cross station. So I’m left on my own doing the shunting - the engine was a class N2, Met. tank. Ok, it wasn’t hectic and I enjoyed it of course, being only about 18 or 19 at the time. Larry must have had faith in me to leave me to it while he pursued his ‘dalliances’. I once had a week on nights with Driver F. Whitham, of Finsbury Park signing on point, on a railcar (105 class?) to Hertford and back three or four times, mainly put on for staff, I believe. I was also often sent to Hatfield to fire with a driver there over to Dunstable and Luton on a single line from Welwyn, and goods to Hertford (East was it?). Even had a trip or three with Hornsey drivers across to Bricklayer’s Arms on the Southern Region. Got around a bit and enjoyed every minute. I remember Bill Hoole. I never fired for him - luckily maybe, though it would be nice to say you had. I was turning an A1 engine one day at Top Shed with Roy Seekings, a passed fireman, and we had to push the turntable round by hand because the vacuum machine wasn’t working. As we were about round, and nearly in line with the rails, I attempted to throw the lever over so that it engaged in the slot to fix the table in position. The table was only just moving and the lever seemed to engage, but then it sprang violently out and smacked me right in the middle of the peak on my cap. It made a nice gash in my forehead and a nice dent in my cap. I saw stars I think, and sat down on the rails for a few minutes to recover myself. I seemed ok, but was sent to the Royal Free Hospital, checked over, patched up and released. My mate Roy wore a cloth cap but reckoned he might start wearing a railway cap, as it seemed to have saved me from a worse injury perhaps. Another little story (I have a habit of this! Is it my age?). I once had to go in front of Mr. Townend [the Shed Master], cap-in-hand, for a rollicking. I had caused a derailment on the shed by switching some points, waving the driver back, and bump! bump! bump! - the tender dropped onto the sleepers as the driver quickly braked (it was an A4 as well!!!). My fault of course - there was a lump of coal in the switch blades and they hadn’t gone over properly. ‘P.N.T.’ told me I'd soon be back at Grantham if I caused any more trouble! I seem to remember it said that King’s Cross men weren’t keen on the A1s, much preferring A4s. Peter Townend instigated a lot of improvements to the A4s and the A3s. The double blastpipes/chimneys certainly rejuvenated the A3s. They were very free steaming, and well capable of maintaining diesel timings of the day – certainly compared with the English Electric Type 4 2,000 hp [later Class 40] anyway. Most of the lads were homesick and allowed home. I think all the Grantham ones were back home in six months, except me. I think they forgot about me, and I was quite happy firing at King’s Cross, instead of cleaning or shovelling ash out of ashpits and up into a wagon at Grantham, which is what you did as a passed cleaner if not firing. Grantham didn’t have the luxury of ‘wet pits’ like New England or a mechanical dredger thing like at Top Shed. Indeed at King's Cross we firemen rarely had to clean fires even. There was a gang of, how can I put it in these ‘pc’ days, coloured gentlemen to do such things. I mentioned before about going ‘down the hole’ to Moorgate. Going down was followed by the suffocating experience of the engine working hard coming back uphill ‘out the hole’ into platform 16 (at that time) at King’s Cross. I only went once or twice, but I don't think the condensing gear on the N2 locos was very effective! The goods trains I went on with Hornsey men went down there onto the Southern also. I also went a time or two down to Broad Street with passenger trains; we used to turn off the main line at Finsbury Park through Highbury Vale, the return route tunnelling under the main lines back up to Finsbury Park - alongside where the diesel depot was later built. During my two years at King's Cross I got to know the road as far as Wood Green - every signal, all the yards and sidings. It was a very enjoyable experience, and the humour of the cockneys was brilliant.